Right off the bat, I'm certainly not condoning fake name brand guitars nor am I suggesting you misrepresent the origin of your gear. As you will see, these labels are 100% honest, clearly worded and for anything other than a quick glance will fool no one. 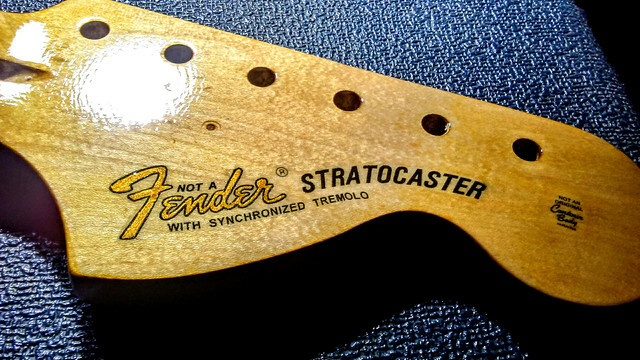 That said I want to share how, using no special materials, to add these novelty logos to your guitar headstock and make it look like a factory job. To do this logo right, it needs to be applied using a very thin, clear backing material. The vintage originals used water slide decals and if you happen to have blank printable waterslides then by all means feel free use the logo below and go to town. For the rest of us, I've found printable tshirt iron-on transfer sheets (available at any art/craft or office supply stores) provide equal quality results but need careful technique applying. 1) Save logo image below then open in image software of your choice. 2) Resize image to whatever you plan to put on your guitar, print drafts on plain paper to check size. 3) Once size is confirmed, print onto a transfer sheet. Make sure you use the highest available resolution/quality to print. 4) Using sharp scissors or a fresh x-acto, cut just inside of the red line to remove excess material around logo. As the edge will be slightly visible, try to be as neat as possible. 5) Remove strings & tuners then sand headstock down to bare wood (600 grit suggested for final finish), clean all dust off with damp rag, then let dry. 9) Let it cool down for a few minutes, remove tape and carefully peel paper backing off. 10) If something went wrong and logo smeared, tore, etc. ....no worries, just sand it back to bare wood and start over. 12) Apply several thin coats of clear spray finish, let dry and you're done. The only tricky part of this is the actual ironing. It's a bit tough to know how much pressure to use for a good transfer and easy to accidentally smear it (even with tape) so my advice is to print several transfers and practice a few times on a piece of spare wood to get the hang of what it takes to get good results. 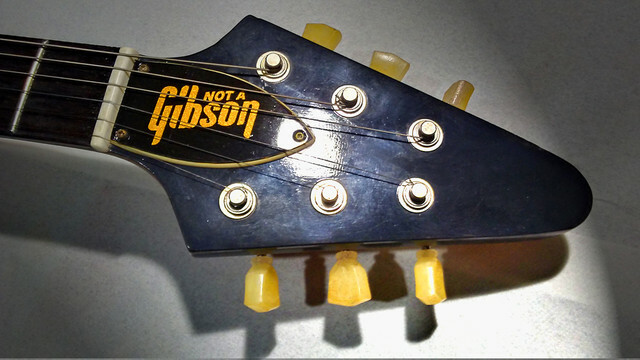 Because most of these style guitars have black headstocks and it is complicated to print whites, your best bet here is to make a truss rod cover. This is the procedure. 1) Remove truss cover from guitar and sand to a rough surface. 2) Spray a couple nice even coats of paint using a gold metalflake finish. 3) Download logo below and open in imaging software of your choice. 4) Resize to fit your truss cover, making sure that entire cover will be blacked except for the letters, print drafts on plain paper until you have the right size. This one is much easier than the other but it can be tricky finding nice, clear adhesive label material to print onto but otherwise this is simple.